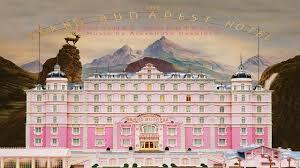 Set in famous hotel in the fictional Republic of Zubrowka between the first and second World Wars. The film follows the comic adventures of a legendary concierge who teams up with a lobby boy to prove his innocence after he is framed for murder.. Released to critical acclaim, it features an all star cast including, Ralph Fiennes , F. Murray Abraham, Tilda Swinton, Edward Norton, Jude Law, Bill Murray, Tom Wilkinson, Willem Dafoe, Adrien Brody, Owen Wilson, Jeff Goldblum and many others. Posted on August 22, 2014, in films. Bookmark the permalink. 2 Comments.